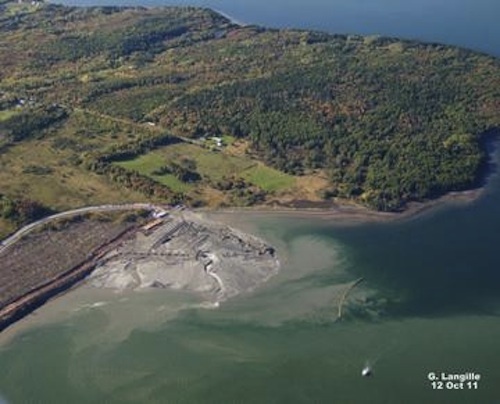 A 100-hectare sediment plume kicked up by the Sydney Harbor dredging project, and presumably laden with industrial contaminants, has some officials annoyed over Environment Canada’s failure to regulate the project. Gerry Langille, a Sydney-based industrial photographer often used by government agencies, snapped the photos Wednesday in calm conditions at slack tide. They have since circulated widely among federal and provincial bureaucrats. The Google Earth screenshot at left shows the approximate location of the upper photograph. The photo below shows the shoreline at Pt. Edward where the dredged material makes landfall, and where most of the sedimentation appears to originate. The infilled material will supposedly form the foundation for a container pier, but provincial and federal officials are privately skeptical it will ever be built. The $38-million dredging project, condemned by some as a costly boondoggle raising false hopes for economic revival in Sydney, was widely seen as an effort to elect Conservative candidate Cecil Clarke in last spring’s federal election. Clarke lost narrowly to five-term Liberal MP Mark Eyking, but was subsequently hired as a $135,000/year consultant to the Cape Breton County Economic Development Agency. The position is funded by Enterprise Cape Breton Corporation, the federal agency funding Ottawa’s share of the dredging project. 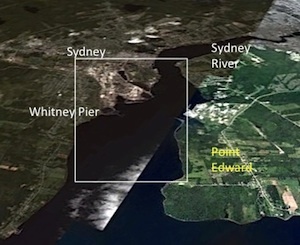 The Sydney Tar Ponds were first identified as an environmental problem in 1982, when fisheries scientists found high levels of polynuclear aromatic hydrocarbons (PAHs) in lobster caught in Sydney Harbor. They fingered the Tar Ponds as the probable source. 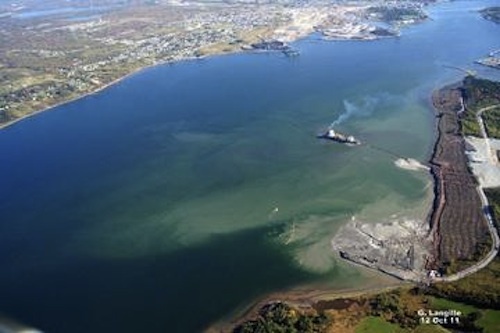 A 2002 report by Kenneth Lee of the Bedford Institute of Oceanography found harbor sediments contaminated with widely varying levels of industrial chemicals, particularly PAHs. Contaminant levels are thought to have declined since the coke ovens stopped operating in 1988, thanks to dispersion from tidal action, storms, and the prop wash from the large cruise ships that regularly dock just outside the Tar Ponds. The dredging project, sold as a first step to the container terminal, received provincial environmental approval in 2009, based on an environmental assessment prepared by the engineering firm Jacques Whitford. In 2009, and again last February, the Canadian Environmental Assessment Agency approved the project based on an environmental screening, the lightest form of environmental assessment, but the screening report does not appear on the agency’s hard-to-navigate website. Officials of Public Works and Government Services Canada, the federal department responsible for the Tar Ponds cleanup, threatened to suspend marine effects monitoring of that project Friday because uncontrolled sedimentation from the nearby harbor dredging would obliterate the small amount of sediments escaping the Tar Ponds. One official, who spoke on condition of anonymity because they were not authorized to discuss the issue, complained of a double standard by Environment Canada and the Department of Fisheries and Oceans. Just last week, Environment Canada ordered the provincial Sydney Tar Ponds Agency to lift a control boom at the outer edge of the Tar Ponds so a Cape Islander could enter the North Tar Pond and collect sediment samples. Meanwhile, the same agencies took no action as the dredging project kicked up a huge plume of presumably contaminated sediments a few hundred meters away.